lawTechCampLondon 2012 is a BarCamp-style community UnConference for new media and technology enthusiasts and legal professionals including bloggers, twitters, legal-technology lawyers, social networkers, and anyone curious about new media and the law. Building off the strength of LawTechCamp Toronto – LawTechCamp London will be the first such event held in outside of North America. 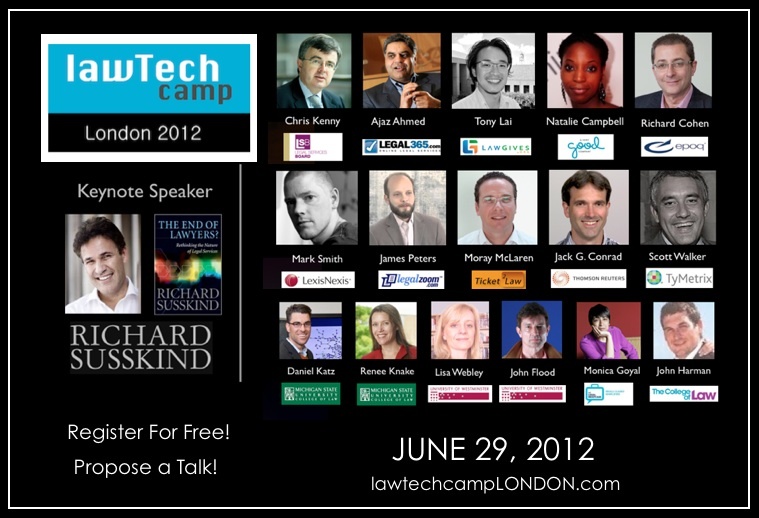 lawTechCamp is not just for lawyers. If you are interested in the intersection of law and technology, such as legal issues facing startups, access to justice issues, or someone just interested in technology or law, then please join us – and bring a friend or colleague. This event is casual, with active participation between the audience and the workshop presenters and event-attendees. Attendance is free, but registration is required.